The Village at Breckenridge is in the dead center of town. No, it's not a cemetery, and its vibrancy is really missed while under construction. 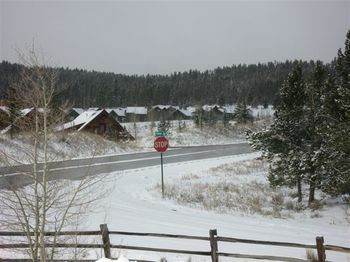 Everyone knows the Village is one of the most convenient places to stay in town -- winter or summer. Buses stop right in front, Main Street is just a 1/2 block away, ski lifts, runs and trails on Peak 9 are just out the back. But the multi-story post-modern Village has been looking a little old-fashioned lately with all the new building going on at the base of the other peaks -- Peaks 7 & 8. 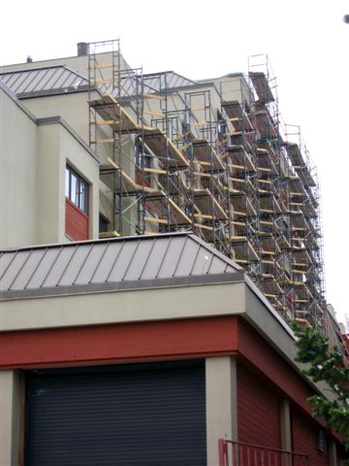 The remodel was approved more than a year ago, and is now going full tilt. Work will continue through 2011. Above you can see what it will look like; to the right is what it looks like now. Click on the link for the most recent project status update. The HOA website has more. There are slide shows of the project and a resource page: Village reconstruction HOA . The whole project is expected to cost about $22 million, which is about $75/sq. ft. The renovation has prompted some deals to show up on the market offered by homeowners that don't want to endure this process, but the long-term benefits will be improved rental revenue and higher property values. 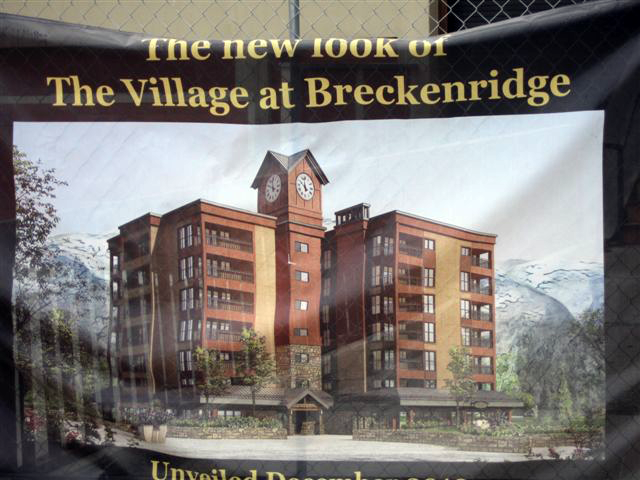 The Village at Breckenridge is an existing multi-building, mixed-use complex located at the base of Peak 9 in Breckenridge with commercial, retail and privately owned condominiums. There are a total of 5 buildings consisting of 235 residential and 28 commercial units surrounded by a plaza and undergound parking. These 5 buildings will receive an exterior remodel in Phase I, to consist of new windows/patio doors at residential units, new storefront at the commercial space, EFIS coatings, new stone veneer, new cementious siding materials, deck coatings, re-roof, new building mounted light fixtures and new architectural elements to include a clock tower at Plaza 3. Phase II will follow in 2011 and consist of new concrete resurfacing and waterproofing at the elevated plaza, new and added landscaping, planters and exterior lighting. 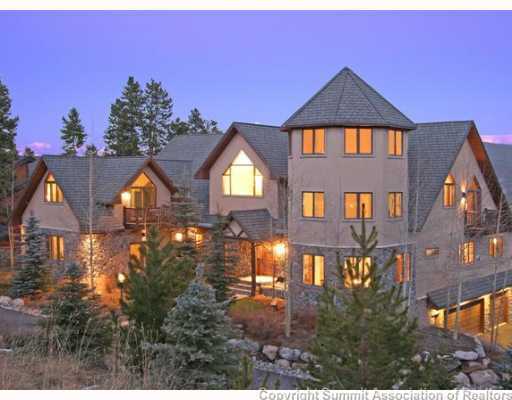 SkiHome Subdivision is seven single family homes on the Four O'Clock ski run of Peak 8. Currently, there are two homes in this ideal location that are for sale at great prices. One is just over 10 thousand square feet and the other is just under that mark. SKI IN & SKI OUT HOME FOR ONLY 280 DOLLARS per Sq FT.
One home at 17 Ski Home Drive was built to be the retirement home for the builder's parents. The original listing price has been slashed by more than $1,100,000 and is currently offered for $2,260,000. Because this home was built to be worry-free for the parents, the appliances, the trim, the details and the fixtures are all high end. The heating system has a 50-year warranty; the boiler is top of the line. The interior walls are low maintenance, sound-proofed Venetian stucco. Huge decks with amazing views are just some of the extra bennies. The lot alone is easily worth more than $600,000 and there is no way that this house could be built for the price offered. Next door, is another house by the same builder, now being offered at $4,690,000. 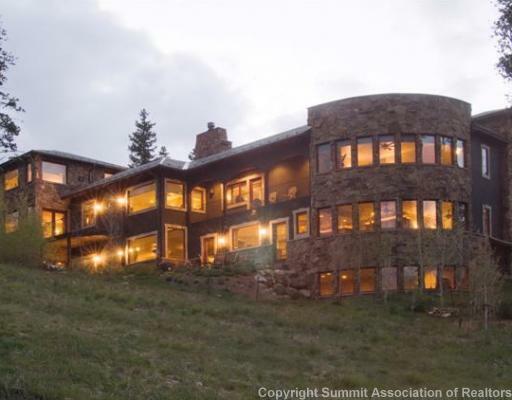 It has the same high quality construction throughout, and on top, there's a 2,000 square foot (rooftop) deck that offers 360 degree views of Breckenridge. About two MILES of high-quality wood trim grace the inside. A few more features are exceptional, too: the steam shower, an exterior water feature and a garden that is so well positioned it is ready to plant a month sooner than anything else at this altitude. For the Fifth of May a new restaurant opened in Breckenridge on Ridge Street, next door to Fatty's and across from Angels Hollow. La Montana Linda, run by a mother and daughter team, is located in a building that was one of the three beverage points in the old Devil's Triangle. La Montana is muy linda outside with a great sunny deck right on Ridge Street. And great green chili. 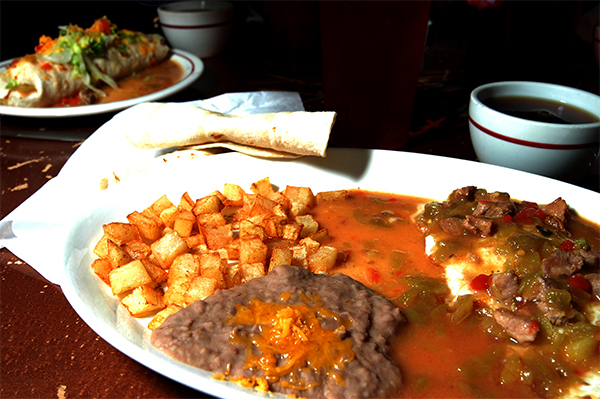 Start with a daily special breakfast burrito, then take New Mexico style enchiladas for lunch - or dinner. The restaurant's open all day and has a full bar. The nice thing this time of year is that Montana Linda is open at all. Everyday from 8 am. to 10 pm. And the breakfast burritos are great. Everything you want in a huevos rancheros except the beans and it's a dollar cheaper. The homefries are good, the tortillas are fresh (not as fresh as homemade, but fresh) and did I already say the green chili is excellent? The beans are the red-beige mound that I usually avoid. But - the green chili is excellent. Our server -- the daughter of the team -- offered to smother my burrito in mild or hot, and so, of course, I chose hot, but my guests who want to try everything had both. More chopped green chilis were added to mine. It was hotter but not less flavorful. The breakfast burrito came with green chili inside and smothering the top. Montana Linda gives me a shiver of nostalgia. I could see a little homesickness for the old Devil's Triangle on the faces of the old timers on the bar stools. I'm going back for the promised enchiladas. 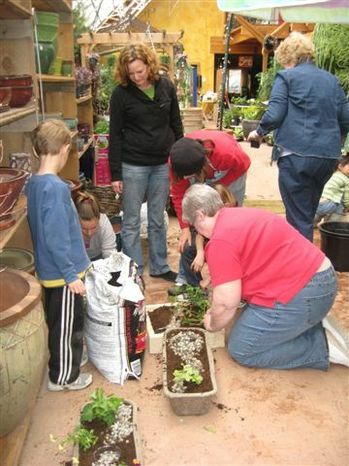 When I was at Alpine Garden's Earth Center I discovered that the garden center is partnering with the Summit Prevention Alliance. They've built greenhouses at the senior center in Frisco and seniors and low-income families can have a plot if they'd like. Anyone can volunteer to help. Summit Prevention Alliance hired Holle Vliet to be the chief farmer to staff the greenhouses. Holle will grow and distribute produce for the food banks and lead the volunteers. She's been growing vegetables in Summit County since she was five and has been the Nursery Manager for Summit Landscaping in Breckenridge. She will be available at the garden site starting in May to help plant and grow arugula, broccoli, cauliflower, lettuce, chives, mint, sage, thyme and others. 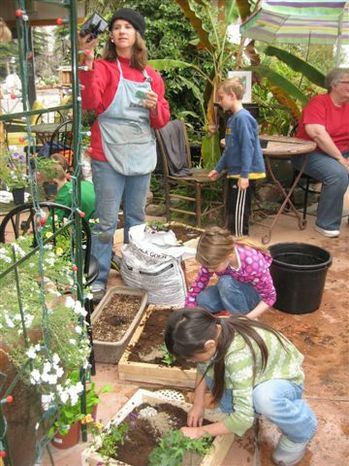 Please call or email Joanna Rybak for a garden plot application and/or volunteer opportunities at (970)453-9333 or visit the Alpine Garden website for more information on building greenhouses. joanna@summitprevetionalliance.org. 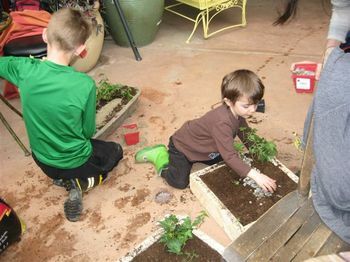 Beginner gardeners are welcome! No experience necessary. 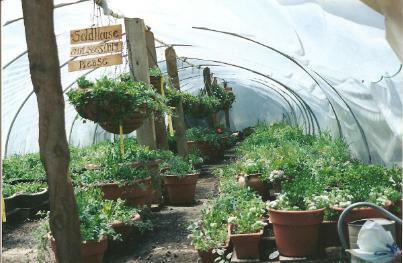 Go to Alpine Garden's website for more info about greenhouse building. Gold Camp -- Right on Ski Hill Road. BANK OWNED - SOLD AS-IS*BUYER TO VERIFY HOA*ALLOW 72HRS FOR RESPONSE*SELLER TO PROVIDE 2 YR HOME WARRANTY TO OCC*REO -- Top floor condo w/ vaulted ceilings. 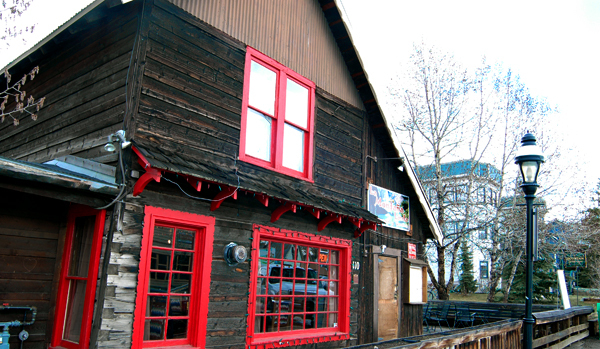 Great location walk to Peak 8, on bus route, & across from Breckenridge Nordic Center. A great value! New interior paint & carpet!! 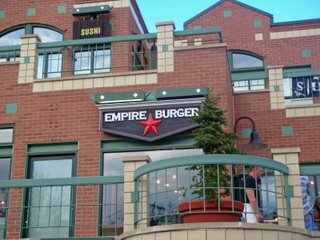 There are many Summit County restaurants that close their doors in May, but not Empire Burger. And that's a good thing, because it's closure would make this in between season just a notch worse. Many people would miss the great burgers and sandwiches, and the open, easy-to-like atmosphere. Empire Burger has a full bar, and offers nice wine and beer. I don't seek out burgers. but this place is worth it. The beef is ground daily on the premises from USDA certified Harris Ranch, Black Angus Choice Beef. And the fries are hand cut daily. Onions rings are likewise fresh and both come with one of a long list of great fresh sauces, like Sriracha Mayo, Red Wine Vinagrette, Blue Cheese, Creamy Horseradish, Parmesan Peppercorn, Honey Mustard, Sweet Mango Chutney Mayo, Roasted Garlic Mayo, BBQ Sauce, Curry Ketchup, Blue Cheese Vinagrette, Sweet Chili Sauce. So, you're not into burgers, my favorite sandwich is the Portabello Mushroom with Blue Cheese. And the Cobb Salad is to die for. Empire Burger is run by the guys from Giampietro's Pizza & Pasta, and is located in the LaCima Mall at the south end of Breckenridge. Here are some recent pics snapped over the last four days of the Mama Fox and her three kits. The photos were taken near my office at about 8 a.m. Sunday morning. 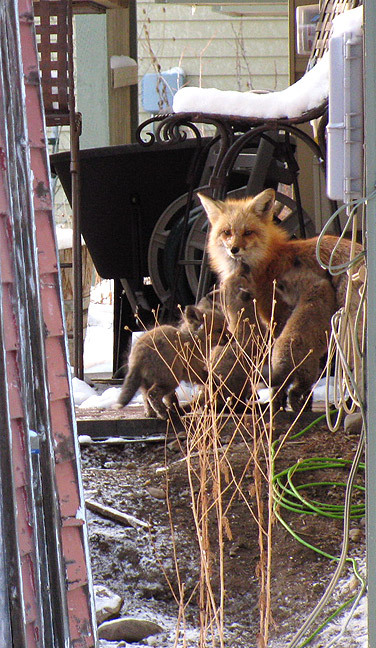 The mama is very diligent, but she sure as hell picked a rotten spot to whelp a bunch of pups. The third kit, the runt, was out this morning ready for a photo shoot. 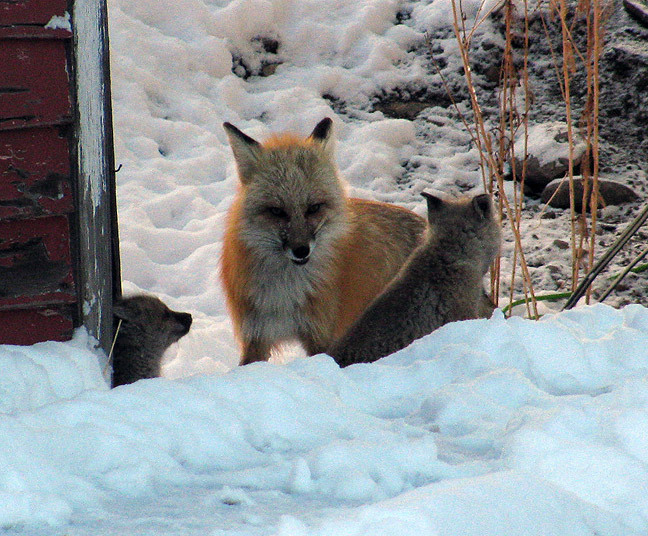 In the group shot, below, the runt is the little one on the left. It is a bit smaller and a whole lot more scared. 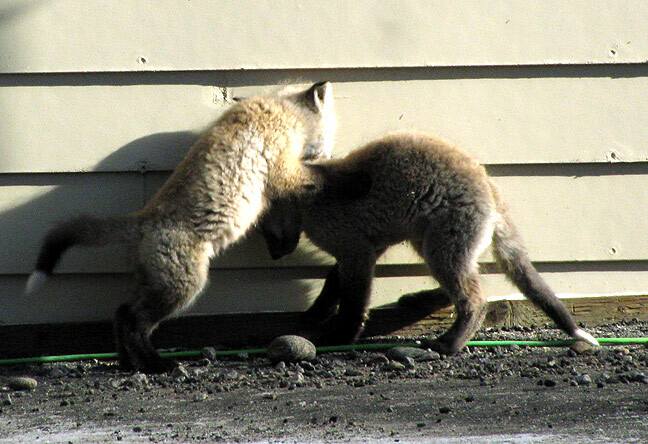 It keeps running back to the burrow entrance next to this old red shack where people park their cars not 4-feet away from the den entrance. Hiking on the ski area in the summer, I always count on seeing foxes. I've also seen them run through neighborhoods right in town. 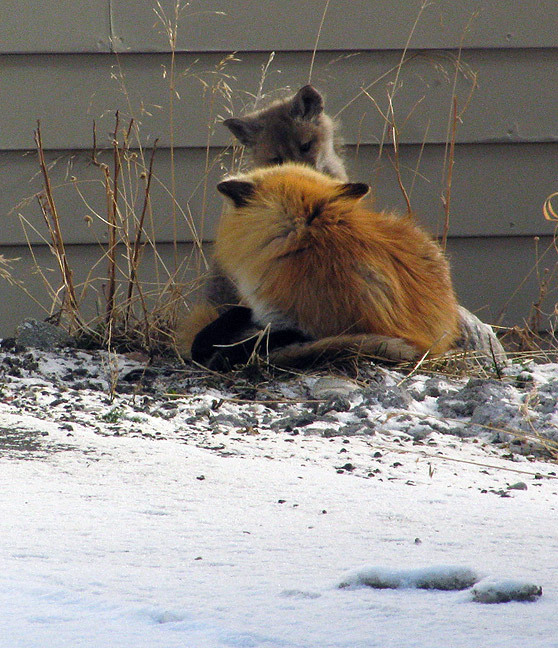 But this sighting, well I guess this is really a sign of SPRING in the mountains. Snow may still be falling, the highway may get clogged up with people who have removed their snow tires, but nature keeps right on schedule. They used to call it Mud Season. That's being generous. Mud is around when it's nice enough to melt. 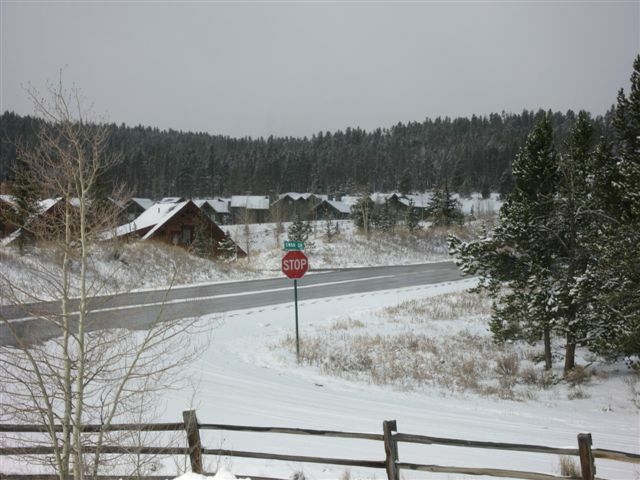 April and May storms -- after the ski resort closes -- seem so redundant. Everyone -- no matter where they live -- knows the feeling: we appreciate the moisture when it rains, or in our case snows, but really long for, can't wait to feel some, might plan a vacation soon to find some warm sunshine. Just a little reminder to appreaciate the days hiking in the mountains, riding bikes and getting on the water. 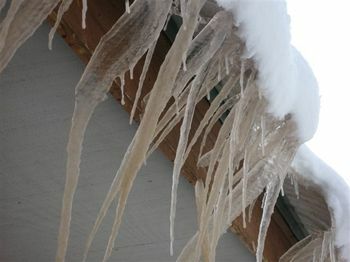 It seems so far away when the view from my deck is non existent and the icicles are hanging low and dirty with debris the wind picked up from dust storms in Arizona. Time to pick up a good book.